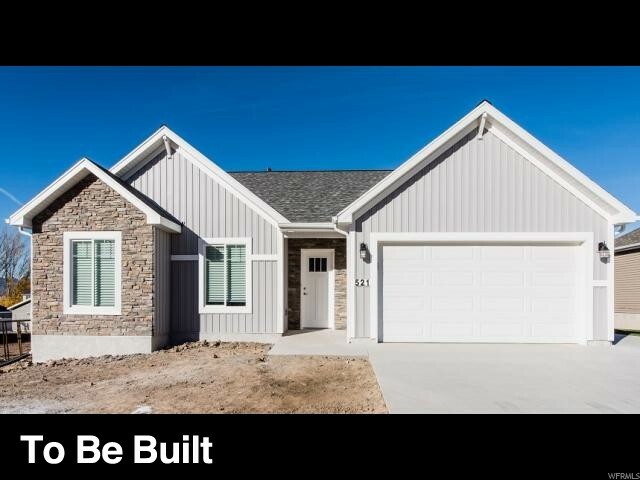 All Lewiston homes currently listed for sale in Lewiston as of 04/19/2019 are shown below. You can change the search criteria at any time by pressing the 'Change Search' button below. If you have any questions or you would like more information about any Lewiston homes for sale or other Lewiston real estate, please contact us and one of our knowledgeable Lewiston REALTORS® would be pleased to assist you. "Own a piece of history with this unique, one of a kind home. Overflowing with creativity and rich in history; exceptional properties such as this are seldom available. 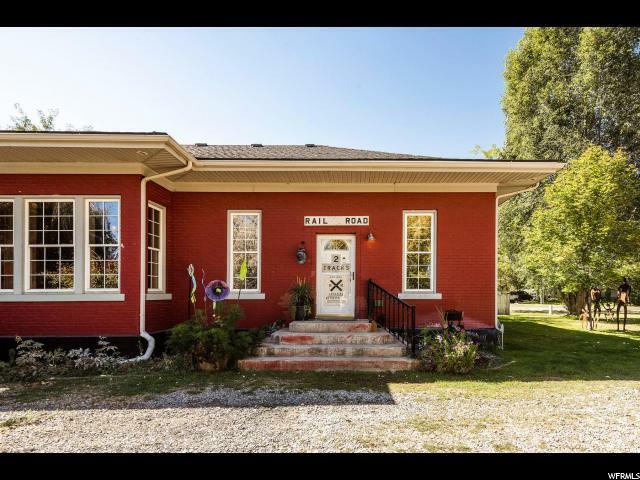 Located in the majestic Cache Valley, this converted former train station is currently the residence of a world renowned metal sculptor and is a special blend of old and new. As you cross the threshold into the open flowing spaces, your excitement grows as you notice the station's original ticket window at the heart of the home. This historical highlight, complete with sliding glass window and metal bars, has been well preserved and is situated between the cooking, dining and living spaces. Bead board ceilings and fine millwork, including 12 inch baseboards, are present throughout most of the home. Natural light bathes the cozy yet spacious eat in kitchen which was recently enhanced by new stainless steel appliances. The en-suite master bedroom is generously proportioned and French doors lead onto an adjacent private deck making it the perfect place to greet each new day. Two bedrooms are positioned opposite one another so night owls and early birds can live harmoniously. Fine details such as hand scraped alder floors, copper sink, and original art glass wall sconces which illuminate the hall, enhance the artistic nature of the home. 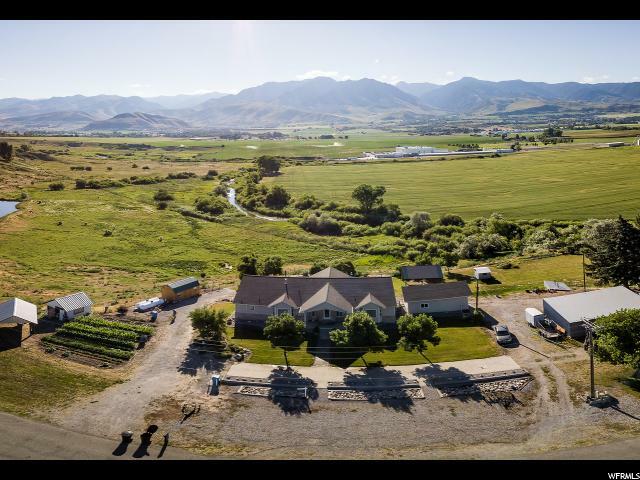 This welcoming property, situated on 2.53 acres, has breathtaking views of the Bear River mountains and Cherry Peak Ski Resort. Yours will be the home where friends gather on a brisk autumn evening by the fire pit.. Bring your Appaloosa's and trailer as most animals are permitted. Work on your vintage Ford in the middle of January in the oversized detached artists' studio/shop/garage. It's heated, has front and back garage doors, and 220 power. An additional detached garage and Art silo provide extra storage for tools, parts or supplies. Original artwork work, including: custom metal gates, bicycle fence, B-12 bomber/truck installation, fire pit, fountain, and a winged in"
"You will have a hard time finding anything with a more stunning, unobstructed view of the mountains to the east and the valley and mountains to the west. Wake up to the sun coming up over the mountains outside your window. So gorgeous! This home is a 6 bedroom, 4 and 3/4 baths, with 2 kitchens and plenty of room for guests and family to gather. Appraiser said nearly 5500 square feet. A covered deck spans the entire back of the house with access from the family room and bedrooms. The totally landscaped back yard is watered with a full sprinkler system. There is room for your horses or livestock. An additional 12 acres may be negotiated. Come to the north end of Cache Valley with less people and more elbow room! Call soon to set an appointment to see this one!" "To be built. Price is considered a start price. Pick your own colors, finishes and upgrades. Located conveniently in great community. Photos reflect a previous built. Completion would be 5 months after dig. Taxes to be determined. Lot will be split off larger lot at settlement. House number will be established by county. Buyer to verify all data. "